Torn betweeen ‘Lydia the Tattooed Lady’ and ‘Bread and Roses’. and id really like to win a new deck!!! “stick to the B.E.A.T, just as easy as A.B.C” Whoot! my favourite song at the moment and of all time has to be – Camp Lo-Lucini. it was on Rob Selleys section on the old Blueprint-Anthems video. such as sick toon!! His track “Dangerous” is ill to skate to. At the moment it is Dirty Little Secrets By the All-American Rejects as I’m totally loving playing it on Rock Band! 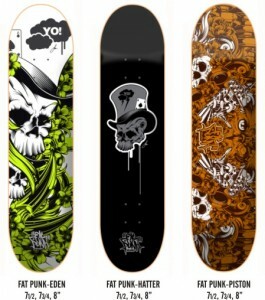 Want that deck so much! Thanks to this great blog. A lot of material.